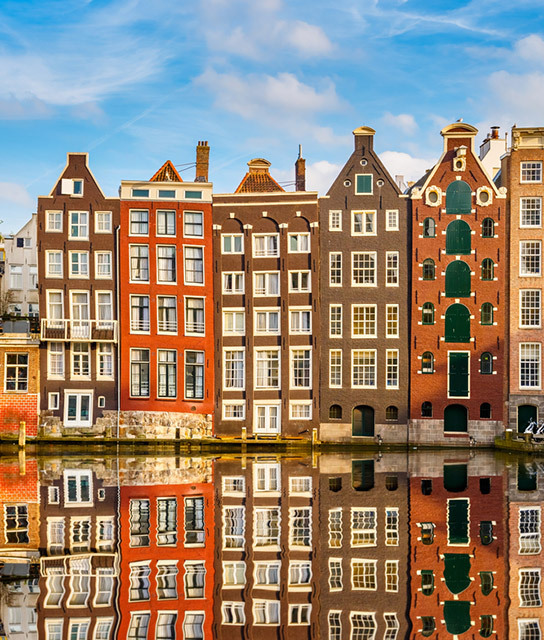 With its legendary 17th-century buildings, historic canals, and picturesque windmills, Amsterdam doesn’t easily embrace new architecture. That sentiment was both reaffirmed with the debut of the befuddling new Stedelijk Museum (it looks like a $170 million bathtub) and debunked by the spectacular new film institute, the Eye, which was greeted warmly. All of which is to say: Amsterdam is nothing if not a place of contradictions. Pot and prostitution are as legal and as ubiquitous here as boutique and luxury Amsterdam hotels, but so too are masterpieces by Rembrandt, Van Gogh, and Vermeer. Take Amsterdam as it comes to you—by bike or boat. Experience beer and comfort food in a traditional brown cafe, but also revel in the fact that the Dutch capital is finally welcoming new food culture (amid our great boutique hotels in Amsterdam), rooted in local ingredients and shaped by creative chefs. Below find a list of our selection of boutique and luxury hotels in Amsterdam. Experience Amsterdam’s creative De Pijp district in a former 19th-century diamond factory, now a dazzling setting for the modern-day creative class. Located in the iconic A'dam Tower in Amsterdam's creative heart, the music-focused Sir Adam includes a music library and studios for guest collaboration.